Published 6 days ago. About a 5 minute read. Environmental sustainability consulting group Quantis is proud to announce the public release of Accounting for Natural Climate Solutions: Guidance for Measuring GHG Emissions from Land, Forests and Soils across the Supply Chain. The Guidance (previously called the Land Use Change Guidance) provides a robust methodology to effectively measure greenhouse gas (GHG) emissions from land, forests and soils across the supply chain — for embedding in corporate and product footprints, which can be used for science-based climate target-setting efforts. 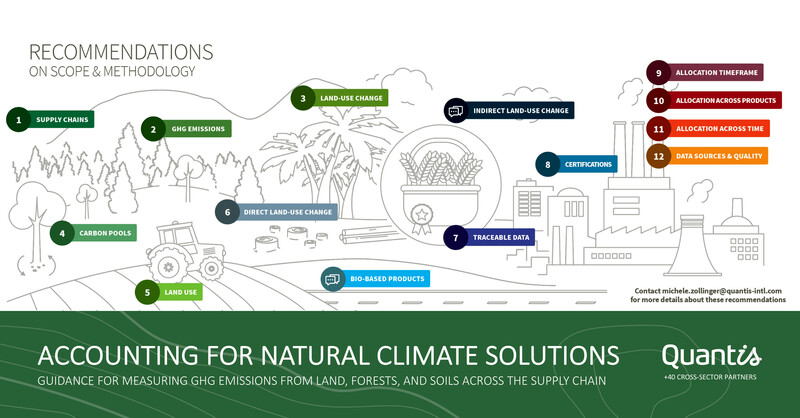 Indeed, natural climate solutions – from forests, agriculture, soil and land – have been recognized as key levers in mitigating the negative impacts of climate change. According to the IPCC, GHG emissions from agriculture, forestry and other land-use activities account for 24 percent of global impacts, second only to the energy sector. Half of these GHG emissions can be traced back to land use and land-use changes, including deforestation. The Accounting for Natural Climate Solutions Guidance was developed within an unprecedented, collaborative multi-stakeholder initiative led by Quantis. More than 40 private companies, NGOs, governments and scientific institutions banded together to develop a solution to a major challenge: how to effectively and reliably account for greenhouse gas impacts from land and land-use change to ultimately prevent deforestation and to promote soil restoration. After a rigorous pilot process in 2018, the outcome is the robust methodology that is now publicly available in a guidance. The Guidance provides a groundbreaking accounting framework set to transform industries strongly impacted by land-use change – especially food and fashion. The project has already brought together industrial partners including Atvos, Barry Callebaut, Braskem, General Mills, IKEA, L’Oréal, LVMH, Mars, Mondelēz International, PepsiCo, Philip Morris International and Pirelli; organizations such as ADEME, Ceres, CDP, Climate-KIC, Continuum Textiles, EcoAct, Navigant, Embrapa, Global Canopy, Gold Standard, IINAS, Mercer Environment Associates, moja global, Permian Global, Rainforest Alliance, South Pole Group, Supply Change, Textile Exchange and WWF also contributed to the work. Forests and soils store large amounts of carbon; therefore, forest burning and soil exploitation contribute significantly to human-made GHG emissions. An increasing number of food and apparel companies are seeking to establish deforestation-free supply chains as part of their efforts to develop a truly sustainable business model. This could only be made possible with science. The Guidance addressed this urgent need for a standardized, scientifically accurate methodology to include GHG emissions from land, forests, and soils across the supply chain in corporate GHG accounting efforts, action plans and goals by providing 12 key recommendations. The initiative convened in October 2016 to develop a set of recommendations in a methodology that consolidates, aligns and builds upon pre-existing references. Last year, the initial Guidance underwent a rigorous pilot phase to ensure that the recommendations were relevant, accurate and actionable. 11 pilot projects were implemented with Braskem, IKEA, PMI, General Mills, CDP, WWF and others. It was critical to pilot the Guidance across various applications including supply chain strategy, commodity footprints, soil carbon and bio-based products. Key insights from the pilots were integrated into the final Guidance through stakeholder engagement and dialogue. The Guidance is expected to eventually be standardized through the Greenhouse Gas Protocol, supplier of the world's most widely used greenhouse gas accounting standards. Yet with a Guidance that is publicly available now (rather than an official standard that would take several more years to develop), companies can take immediate and strategic action to fight deforestation and restore soils, with clear integration of these actions in their climate strategies. "This guidance is extremely relevant for Brazil, which is uniquely positioned [to be] a key player in the future bio-economy,” said Yuki Hamilton Onda Kabe, LCA Specialist at Braskem. “When we launched our sugarcane-based polyethylene, we soon realized that understanding [land use change] was paramount to manage our suppliers and also to support our sustainability claims. This guidance enabled us to get in-depth insights on theoretical concepts, decrease our LCA uncertainty levels, to strengthen the relationship with our suppliers, and to ultimately corroborate with satellite imagery the results of our supply management system."